Wood, Frank Watson (1862-1953). Watercolour signed and dated 1915 (LR). 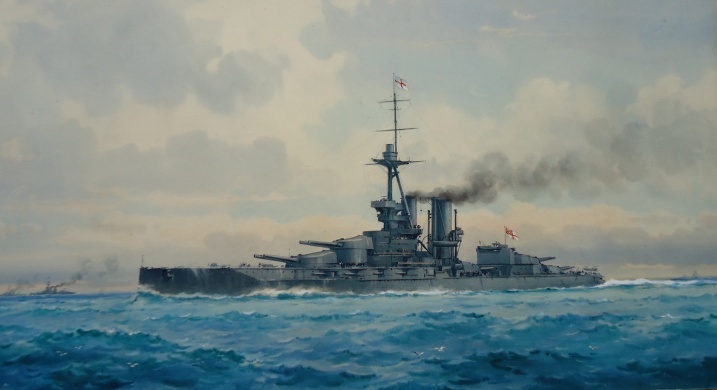 This watercolour is dated 1915 and shows the battleship in the two and a half years during the First World War when she was flagship of the Grand Fleet. At the fore flutters the George Cross of the Commander-in-Chief, Admiral Sir John Jellicoe; and on the bridge her Commanding Officer and Flag Captain, Captain Frederick Dreyer. IRON DUKE was in the thick of it throughout the war and whether it was at sea in endless attempts to bring the enemy to action, swinging round the flagship’s buoy in Scapa Flow fighting the endless storms, gales and foul weather; or in action at Jutland and the other battles and skirmishes in which she and the Grand Fleet were involved, IRON DUKE – and Jellicoe - were names the British public knew!